Next to the globally popular American Bobby Fischer, the greatest chess player that ever lived is probably Paul Morphy from New Orleans. He won the first American Championship in 1857 in New York with a perfect score, and then went on to Europe, financed by his admirers, and played the best in Europe and won every match. In the final game of the American Championship, he beat the great Louis Paulsen with a queen sacrifice. It was the only game that Paulsen lost in the tournament. Morphy scored 9-0 while Paulsen scored 8-1. In Europe he defeated Anderssen from Germany, Harrwitz from France, Lowenthal from the Netherlands, et al. 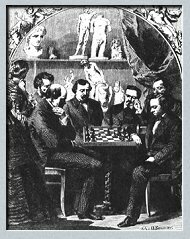 Howard Staunton from England, considered the best player of the day, refused to play him, and it is still considered to this day, that he was afraid to be massacred by the chess genius of Morphy. Morphy then "retired" in 1859, in his twenties, only two years after his meteoric rise to chess fame, because a young woman rebuffed his advances "because he was only a chess player"!! He died an immature death while bathing after a brisk walk. He has always been considered the "Pride and Sorrow" of chess. But I think he was more pride than sorrow, because of his introduction to chess theory of rapid development of pieces, and he almost always placed his pieces on the correct squares. No one in a 3-year period rattled the chess world as Morphy did.